Say Hello to Luis Yepez, Senior World Builder! “Senior World Builder.” Does that make Luis some kind of god? Unfortunately no, it just makes for a really cool job title. (Once you get to know this awesome dude, you’ll understand why we say “unfortunately.”) So, what does he do? It’s a bit of a mixed discipline. I do some stuff that would be considered art and other things that would fall under level design. Basically, I build the world you play in. The nature of the games we build requires the people making the world and playable areas to pull tools from both the environment artist’s palette and the level designer’s trick bag. For State of Decay 2, our Grandmaster World Builder (James McMillan) put together all 3 open-world maps in the game. He established the overall flow and layout. I then came in and worked on composition, navigational awareness, neighborhood layouts, environment storytelling and set dressing. At the end of the day, I get to make you feel the world you are in is real, and that you can traverse in it in fun and exciting ways without hindering your progress or making you feel lost. We are curious, Great Builder of Worlds, what made you want to get into the game industry? I’ve always wanted to make games since I was little. I wasn’t really sure what that meant or how to even do it, but I knew since I was 8 that was what I wanted to do when I grew up. When I was 17 and had to choose what college and profession to pursue, I still wanted to make games but had very little information or anyone around to ask. So the best information I got was to study something computer-related. I prepared as if I was going into the Computer Science field. I was enrolled and ready to go, then 2 months before I started I found an article in a gaming magazine about making art for games. Being that I had always been into drawing and more visual stuff, I pivoted last-minute and went the art route. The rest, well, it’s taken me to where I am today. So after several years in the gaming industry, how did you end up at Undead Labs? You seem to be very happy working here. What is your favorite part about working at UL? The team is amazing. Everyone is focused on working and making a game. No one is just focused on making a portfolio piece or some sort of tech that will show off them as individuals. We all work to lift each other up so the game is the best it can be, because at the end of the day we all care about the player being the happiest they can while spending time in our worlds. The dogs-at-work policy is great, too. Actually, scratch the first part, it’s just the dog policy. 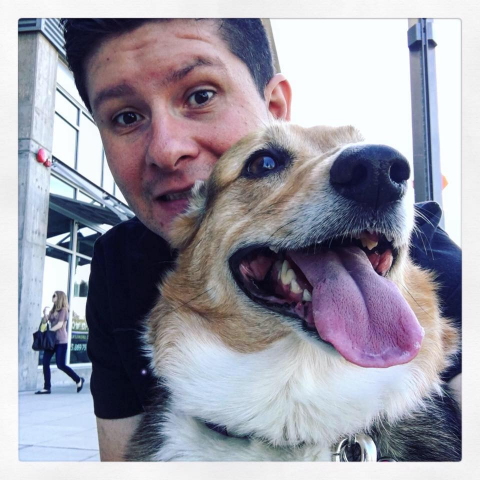 Well, with a Corgi like Kyra how can a company not allow dogs to come to work with you? Last but not least, we would love to hear an interesting fact about you, maybe some information about your life outside work? Well the most obvious one is that I am Mexican and moved from Cancún. I usually hear a lot of, “Why would you ever leave Cancún?” All I can say is I love making games more than living in Cancún, I guess. I do some personal art on the side for Emerald City Comic Con, too. I like fashion quite a bit. My wife is a fashion designer and I have come to learn more and love that industry. So sometimes I’ll stop random people and just say, “I love that jacket.” They look at me weird but hey, they need to know they are rocking it. Have questions for Luis? He’d be happy to answer them! Just comment on the Facebook, Twitter or Instagram post this link was on, and we will collect his answers and send them back to you. Brian Giaime and John “Gronk” Gronquist led the Independence Pack team, making all your zom-pocalypse 4th of July feels come true! Want to know how they came up with the ideas? Can you guess their favorite weapon? Read on!